We develop and license enterprise software implementing rigorous risk methodologies. Our software is used by leading banks, asset managers, funds and public institutions around the world. 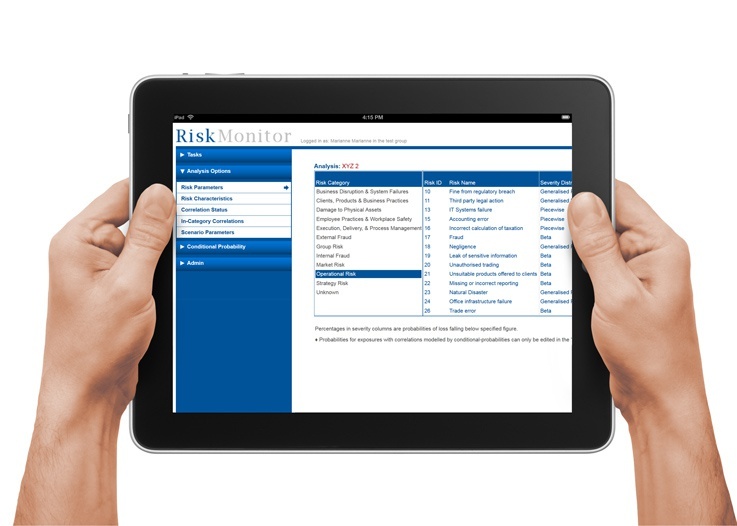 Risk Control offers bespoke solutions precisely matching client needs, built within our flexible software platforms. We assist clients by implementing, validating and enhancing their own internally developed software. Our software is subject to continuous development as we incorporate new features and improvements. Risk Control software is designed to integrate seamlessly with clients’ existing up- and down-stream systems. Scenario-based RORC Optimisation of Bank Loan Book: how top down analysis of a bank’s assets can optimise Return on Regulatory Capital. Consistent Scenario Expansion: data-driven ways of consistently expanding macro scenarios. Banking System Stress Testing: stress testing for a set of banks with inter-bank obligations. Stress Testing for an Asset Manager-Private Bank: stress testing for an asset manager including AUM, balance sheet, and P&L.